Unless you are blessed with a digital mind that instantly processes information and draws insightful conclusions, spend a few moments gathering and arranging specific ideas, arguments, anecdotes, examples—whatever you can think of to support and develop your essay’s main idea. List your thoughts on paper—just a word or two for each idea. These jottings can be the working outline of your essay. Then draw circles around key words, connect related ideas with arrows, or just underline the thoughts you’ll definitely use in your essay. No single technique for gathering ideas excels any other, provided it helps you identify what you’re going to write. While you plan, one idea may trigger a flood of others. Maybe you’ll end up with more brilliant ideas than you can use. (Everyone should have such a problem!) Your task then would be to pick out and develop only the best of the best. With materials assembled, decide what should come first, second, third. The best order is the clearest, the order your reader can follow with the least effort. But, just as a highway map may show several routes from one place to another, there is no single way to get from the beginning to the end of an essay. The route you plan depends on the purpose of the trip. Each purpose will have its own best order. In storytelling, the events are usually placed in the sequence in which they occur. To explain a childhood memory or define an abstract term takes another organization. An essay that compares and contrasts two books or two people may deal with each subject separately or discuss the features of each point by point. No plan is superior to another provided there’s a valid reason for using it. Rank your ideas in order of importance. The plan that fails is the aimless one, the one in which ideas are presented solely according to how they popped into your head. To guard against aimlessness, rank your ideas in order of importance. Then work toward your best point, not away from it. Giving away your pièce de résistance at the start is self-defeating. Therefore, if you’ve come up with, say, three good ideas to support your thesis, save the strongest for last. Launch the essay with your second best, and sandwich your least favorite between the other two. A solid opening draws readers into the essay and creates that all-important first impression, but a memorable ending is even more important. Coming last, it is what readers have fresh in their minds when they assign the essay a grade. It shouldn’t be hard to divide a main idea into three secondary ideas. A narrative essay, for instance, breaks naturally into a beginning, middle, and end. A process is likely to have at least three steps. In an essay of comparison and contrast, you should be able to find at least three similarities and differences to write about. And a similar division into thirds applies to an essay of argumentation—the kind expected on the SAT. Each of three ideas may not demand an equal amount of emphasis, however. You might dispose of the weakest idea in just a couple of sentences, while each of the others requires a whole paragraph. But whatever you emphasize, be sure that each idea is separate and distinct. That is, the third idea mustn’t simply rehash the first or second disguised as something new. 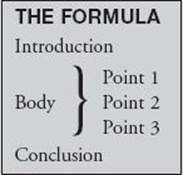 The five-paragraph essay formula is a simple, all-purpose plan for arranging ideas into a clear, easy-to-follow order. It’s a technique you can rely on any time you need to set ideas in order. Its greatest virtue is clarity. Each part has its place and purpose. You needn’t follow the formula to the letter. In fact, a professionally written essay organized according to this five-paragraph arrangement is a rarity. Yet many essay writers, even those who take a circuitous path between the beginning and end, use some version of it. Their introduction tells readers what they plan to say. The body says it, and the conclusion tells readers what they’ve been told. Because every essay is different, however, the steps contain endless, often surprising, variations. Directions: For the following essay topics, write three different and distinct ideas that could be used to support each one. Think of each idea as the main point of a paragraph. Then rank them in order of importance.